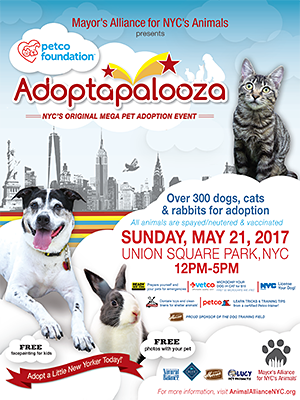 More than 300 dogs, cats, puppies, kittens, and rabbits will be available for adoption from more than 30 New York City area shelters and rescue groups. Confirmed shelters and rescue groups include All About Spay Neuter, Animal Care Centers of NYC (ACC), Animal Haven, The Animal Project, Anjellicle Cats Rescue, ASPCA, Best Bullies, Best Friends–New York, Bideawee, Bronx Tails Cat Rescue, Bully Project, BUMPER Bulldog Rescue, City Critters, Inc., Cypress Feline Rescue, Frankie's Fund for Feline Care and Rescue, Hudson Valley Humane Society, Husky House, Infinite Hope, K9Kastle, KittyKind, Linda's Cat Assistance, Little Wanderers NYC, Long Island Bulldog Rescue, Long Island Greyhound Connection, Louie's Legacy Animal Rescue, Metropolitan Maltese Rescue (MetroMalts), Muddy Paws Rescue, The Patricia H. Ladew Foundation, Place for Cats, Posh Pets Rescue, Pound Hounds Res-Q, PupStarz Rescue, Rabbit Rescue & Rehab/NYC Metro Rabbit, Rescue Dogs Rock NYC, Rescuzilla, Second Chance Rescue, Town of Hempstead Animal Shelter, Waggytail Rescue, and Zani's Furry Friends. Learn about affordable health insurance options (for humans) from MetroPlus Health Plan. Meet Baby Howard and let your dog join him in the Splash Zone at the BUMPER Bulldog Rescue booth. Attend a dog tug toy making session, held on the hour at the Rational Animal booth. 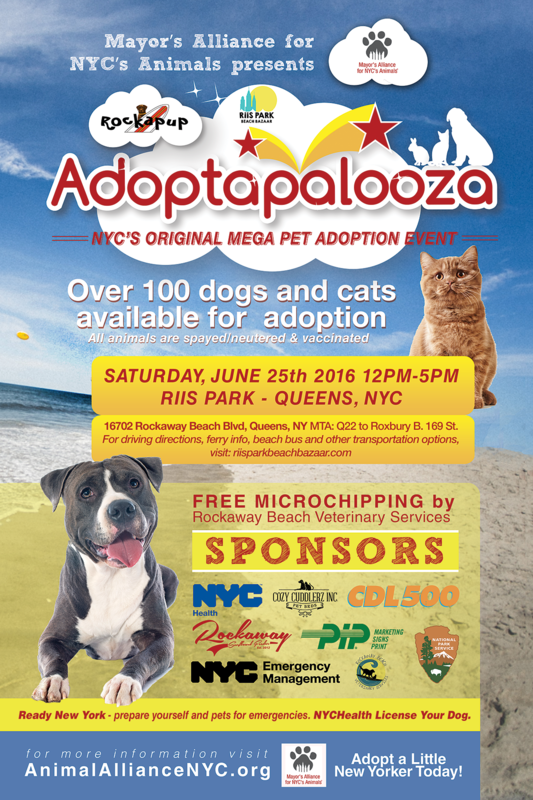 Pick up free pet food samples, other products, and information from pet-related vendors. 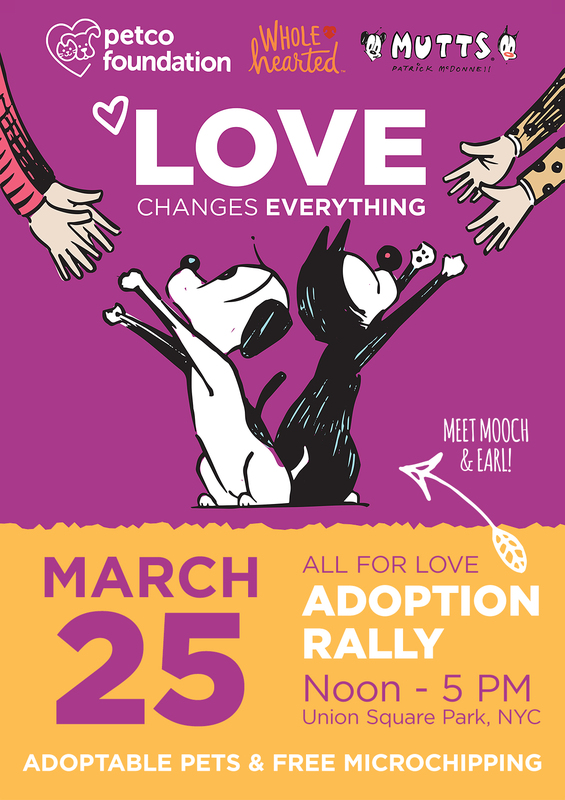 Confirmed vendors include Blue Buffalo, Lucy Pet Products, Merrick, and Natural Balance. Rock & Rawhide will collect your donations of clean towels, blankets, pet toys, and other supplies for shelter animals. Talk to Certified TNR Caretakers from the NYC Feral Cat Initiative about Trap-Neuter-Return (TNR) and how you can help feral and stray community cats in your neighborhood. Meet wildlife experts and rehabilitators and learn about the wild animals who share our urban home at the Urban Utopia Wildlife Rehabilitation, Wild Bird Fund , and Wild Dog Foundation booths. Learn about Rational Animal's new campaign to prevent dog theft, pick up free informational handouts, make a dog tug toy, or make a donation to take home a pet bed, Artists with Animals photo note cards, or other pet-related boutique items.